The Star Trek 50th Anniversary celebration continues! 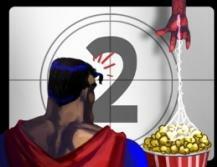 This week's scene is by Bubbawheat from Flights, Tights, and Movie Nights, Channel: Superhero, and The Filmwhys Podcast. Follow him on Twitter at @Bubbawheat. Most people look at the original Trek movies as being a 50/50 shot with the even numbered movies known as the best ones, and often the peak comes early with Wrath of Khan. But I’ve always been just a bit more of a fan of Star Trek VI: The Undiscovered Country. I think it mixes some of the best mystery plots with a bit of action mixed in with the right amount of comedy (more than Wrath of Khan but less than Voyage Home) and ends with the best send off for the original crew possible. We also get a great villain who spouts Shakespeare in Klingon and our first look at a Bird of Prey that can fire while cloaked. The scene that really helps nail the tone of this film is the one after Kirk and McCoy have been put on a mockery of a trial – with Worf’s ancestor as their lawyer no less – and they're sentenced to prison on an ice planet. They escape with the help of a shape-shifting alien known to them as Martia, and played in her most common form by supermodel Iman. We get to see some of the best qualities of Kirk: his intelligence when he realizes what she’s actually trying to accomplish, his fighting skills even in his old age where he gets to fight himself, and a bit of self deprecating meta humor. It’s such a great line when he says “I can’t believe I kissed you,” and the reply is “Must have been your lifelong ambition,” which I’m sure is a knock against his real life ego. Not only that, but the scene ends with a twist on the cliché where the villain is just about to reveal their plans because “you’re going to die anyway” but they get teleported away just before they actually get the information. It’s brilliant and I love it! 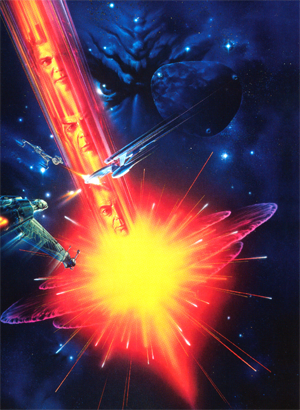 What's your favorite scene from Star Trek VI: The Undiscovered Country? What's your favorite even-numbered Trek film?